1 Universidad Nacional Autónoma de México, Instituto de Biología, Departamento de Botánica, Apdo. postal 70-367, 04510 México, D.F., México. 2 Author for correspondence: gasc@ibunam2.ibiologia.unam.mx †Deceased in August 2009. Recibido en enero de 2012. Aceptado en abril de 2012. 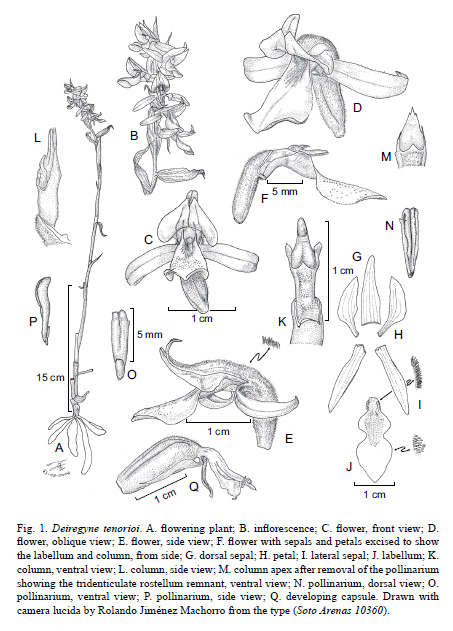 Deiregyne tenorioi Soto Arenas & Salazar, a new orchid species from the Mexican states of Hidalgo, Estado de México, Oaxaca, Puebla, and Tlaxcala, is described and illustrated. It is similar to D. eriophora (B.L. Rob. & Greenm.) Garay and D. chartacea (L.O. Williams) Garay, differing from the former in the sparsely glandular-pubescent inflorescence rachis and ovary (vs. lanuginose), odorless flowers and proportionately longer, narrower labellum with bright green to lemon yellow, narrow throat with straight sides (vs. golden yellow, wide throat with rounded sides); from the latter it differs in larger flowers with sepals and petals not tinged with greenish-brown below the middle, spreading lateral sepals (vs. strongly recurved), and proportionately longer, narrower distal labellum lobe. 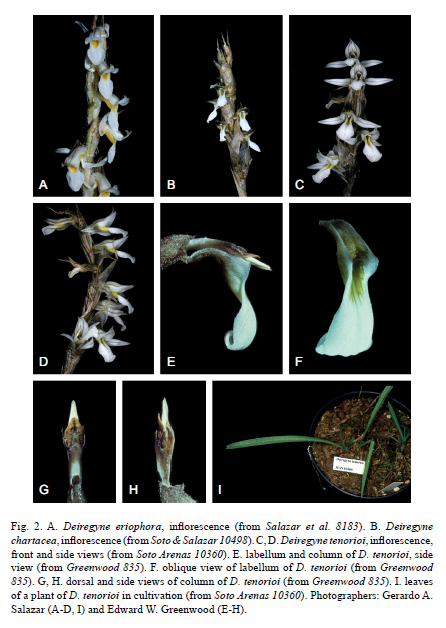 Key words: Deiregyne tenorioi, endemism, México, Orchidaceae, Spiranthinae. Se describe e ilustra Deiregyne tenorioi Soto Arenas & Salazar, especie nueva de los estados de Hidalgo, Estado de México, Oaxaca, Puebla y Tlaxcala en México. Es similar a D. eriophora (B.L. Rob. & Greenm.) Garay y a D. chartacea (L.O. Williams) Garay; de la primera se distingue por el ovario y la inflorescencia con el raquis esparcidamente glandular-pubescente (vs. lanuginoso), las flores inodoras y el labelo proporcionalmente más largo y angosto, con garganta de color verde brillante a amarillo limón, angosta, con los lados rectos (vs. garganta amarilla dorada, amplia, con los lados redondeados); de la segunda difiere en las flores mucho más grandes, los sépalos y pétalos no teñidos de color café verdoso abajo de la mitad, los sépalos laterales extendidos (vs. fuertemente recurvados) y el lóbulo distal del labelo proporcionalmente más largo y angosto. Palabras clave: Deiregyne tenorioi, endemismo, México, Orchidaceae, Spiranthinae. As lectotypified and circumscribed by Garay (1982), the genus Deiregyne Schltr. currently encompasses 12 species distributed in most mountain ranges of México and adjacent Guatemala, with one species, D. obtecta (C. Schweinf) Garay being endemic to the last country (Salazar, 2003; Hágsater et al, 2005; Soto et al., 2007). Recent molecular phylogenetic studies have confirmed that Deiregyne sensu Garay is a morphologically and ecogeographically coherent, monophyletic group (Salazar & Ballesteros-Barrera, 2010; Salazar et al., 2011) that can be distinguished from its close relatives, such as the genera Dichromanthus Garay and Schiedeella Schltr., by the possession of papery, translucent floral bracts provided with dark veins (Catling, 1989; Salazar, 2003, 2009; Salazar et al., 2003, 2011; Salazar & Ballesteros-Barrera, 2010). For several years, we have been acquainted with a distinctive, undescribed species clearly belonging to this genus. The new species has been illustrated and referred to as "Deiregyne tenorioi" in several published works (Hágsater et al., 2005; Salazar et al., 2006; Soto et al., 2007; Szeszko, 2011), but its formal description is offered here for the first time. Deiregyne tenorioi Soto Arenas & Salazar, sp. nov. Figs. 1, 2C-I. Similar to D. eriophora (B.L. Rob. & Greenm.) and D. chartacea (L.O. Williams) Garay; differing from the former in the congested inflorescence with sparsely glandular-pubescent rachis and ovaries (vs. lanuginose), odorless flowers and proportionately longer, narrower labellum with bright green to lemon-yellow, narrow throat with straight sides (vs. wide, golden yellow throat with rounded sides); differing from the latter in the larger flowers with sepals and petals not tinged with greenish-brown below the middle, lateral sepals spreading above the middle (vs. strongly recurved), and proportionately longer, narrower distal labellum lobe. Terrestrial, acaulescent, deciduous herb 13-56 cm in height above ground including the inflorescence. Roots fasciculate, fleshy, cylindrical-fusiform, lanuginose, brownish-white, 25-60 mm long, 4-8 mm in diameter. Leaves 2-3, arranged in a loose basal rosette, withered or absent altogether at flowering time, bright green on the upper side, greyish-green and somewhat glaucous on the underside, narrowly linear-elliptic to linear-oblanceolate, base attenuate and channeled, apex acuminate, mid-vein dorsally carínate; 20-25 cm long, 1-1.2 cm wide. Inflorescence up to 38 cm long; peduncle terete, made up of 9-13 internodes, bronzy- or greenish-brown, glabrous below, sparsely glandular pubescent above, 11-50 cm long, 2-4 mm in diameter, covered by papery sheaths, these tubular-infundibuliform with ovate, acuminate free apical portions, translucent whitish with brown veins, progressively shorter towards the apex, up to 70 mm long and 13 mm wide; raceme subsecund, 2-10 cm long, with 3-13 flowers, most or all of them open at the same time; rachis sparsely and shortly glandular-pubescent. Floral bracts covering completely the ovaries, similar to those of the peduncle, ovate, long-acuminate, concave, somewhat inflated, marginally col-liculate, 15-32 mm long, 5-12 mm wide. Ovary sessile, slightly twisted, ascending, fusiform, 3-keeled, bronzy-green, glandular-pubescent, more densely so towards the apex, 7-9.5 mm long, 2.5-3.7 mm in diameter; trichomes septate. Flowers resupinate, horizontal, tubular-campanulate, odorless, dull white overall, sepals and petals with one and two longitudinal, greenish-brown veins, respectively, labellum with bright green to lemon yellow throat and brownish basal channel. Dorsal sepal arching over the column and labellum, recurved near the apex, lanceolate to triangular-lanceolate, attenuate, acute, concave below the middle, convex above, glandular-pubescent on the outer surface, most notably so on their proximal two-thirds, trichomes inclined forward, 12-16 mm long, 3-5 mm wide. Lateral sepals spreading almost horizontally, recurved, shortly connate by < 1 mm at base, their bases slightly inflated forming a rounded chin, decurrent on the oblique ovary apex for ca. 2 mm, obliquely linear-lanceolate, acute, concave-canaliculate below the middle, convex above, mid-vein thickened on the outside, pubescent like the dorsal sepal, 13.5-18 mm long, 2.8-3 mm wide. Petals clawed, somewhat falcate, the portion above the claw obliquely ovate, acute to shortly acuminate, base decurrent on the ovary apex, upper margin adherent to the dorsal sepal, lower margin free, repand, papillose above the middle; whole petal 11.5-16 mm long, claw 0.5-1.5 mm wide, broader portion above the claw 3.5-5.5 mm wide. Labellum erect, obscurely clawed at base, pandurate, total length 13-18 mm; proximal lobe concave-channeled, provided with an indistinct marginal thickening (nectar gland) at each side of the base, densely pubescent outside near the thickenings (here the trichomes cylindrical), sparsely pubescent on the inner surface (here the trichomes like large papillae), when spread out obtriangular-obovate to subrhombic, somewhat wider near the apex, 6-8 mm long, 5.5-7.3 mm wide, in natural position the sides upright and adhered to the margins of the column forming a narrow throat with straight sides; isthmus 2.3-3.3 mm wide; distal lobe spreading, convex but with the distal margins somewhat inflexed, elliptic to suborbicular or ovate, acute to obtuse, densely papillose, 6-9.5 mm long, 6.3-7 mm wide. Column forming an obtuse angle with the ovary, straight, dorsiventrally compressed, oblong-cuneate, white suffused with dark brown, ventrally shallowly sulcate and densely papillose, 6-8 mm long, 2.3-3.5 mm wide near the apex, provided at each side of the apex with a triangular-ovate, membranaceous, acute auricle; column foot obliquely adnate to the apex of the ovary, papillose, channeled, 2-2.5 mm long, ca. 1.2 mm wide; anther ovate-cordiform, obtuse, 3-3.5 mm long, ca. 3 mm wide, with thick filament. Pollinarium 5-5.5 mm long, ca.1.8 mm wide, formed by 2 subclavate, longitudinally cleft, cream-yellow pollinia; viscidium ventral, apical, sheathing the apex of the rostellum, oblong-lanceolate, obtuse, grey, keeled, ca. 1.8 mm long, 0.6 mm wide. Stigma ventral, ovate-triangular to cordiform, flat, covered by a viscous secretion, its lower margin somewhat bilobed and prominent, 2.3-2.5 mm long, 1.5-1.8 mm wide; rostellum triangular, rounded, after removal of the pollinarium the rostellum remnant laminar, triangular-ovate, three-toothed, middle tooth narrowly triangular, lateral teeth about one-third the length of the middle tooth. Capsule ellipsoid-ob-ovate, 3-sulcate, greenish-brown, pubescent, ca. 17 mm long and 7 mm in diameter. Type: México. Puebla: km 17.4 del camino estatal de Azumbilla a Tepetzintla, 2500 m, 17 March 2004, M. Á Soto Arenas 10360 (holotype: AMO!). Additional specimens examined: México. Hidalgo: 5 km al NW de San Jerónimo, Tepeapulco, bosque de Juniperus deppeana y Pinus rudis, 2800 m, J. Rzedowski 18285 (ENCB); municipio Zempoala, 2 km N de San Mateo Tlajomulco, 2700 m, 21 March 1972, J. Rzedowski 28965 (ENCB). Oaxaca: km 9.2 on road north from Panamerican highway to Coixtlahuaca, 2300 m, 3 February 1979, E. W. Greenwood 835 (AMO); km 8.5, Coixtlahuaca road, 2300 m, 15 February 1979, E. W. Greenwood & L. O. Williams 838 (AMO); km 10.9, Coixtlahuaca road, 2400 m, 18 March 1979, E. W. Greenwood & O. Suárez 852 (AMO, spirit); municipio Santo Domingo Ozolotepec, el Mirasol, 2709 m, 11 February 2010, S. H. Salas 7202 (MEXU, SERO); municipio Tepelmeme de Morelos, la Cucharillera, al N de Ahi-jadero ("Hijaderoaria"), camino de herradura a la Placa, 2675 m, 3 March 2001, P. Tenorio 19961 (MEXU); municipio Santa Catarina Zapoquila, cerro el Chicamole, al E de Membrillos, límites de los estados de Puebla y Oaxaca, ejido Acatitlán, 12 February 1987, P. Tenorio 12478 (MEXU); municipio Santa Catarina Zapoquila, cerro Veinte ídolos, al SW de Membrillos, 2700 m, 6 February 1988, P. Tenorio 14315 (MEXU). Puebla: cerro Guadalupe, 2250 m, 9 March 1908, G. Arséne 1924 (MEXU); parque estatal General Lázaro Cárdenas, 2280 m, 28 February 1995, M. Martínez 654 (MEXU). Tlaxcala: Tlaxco, 2730 m, 19 March 1985, Manrique et al. 1075 (MEXU); municipio San Salvador Tzompantepec, Quetzalcoapan, ca. 2500 m, 20 February 1982, H. Vibrans 977-2 (MEXU). Other records: México. Estado de México: Sierra de Nanchititla, 1800-2000 m, blooming in early February (according to Szeszko, 2011). Tlaxcala: Archaeological site of Cacaxtla, February 2000, H. J. Sandhagen s.n. (in litt, photographs AMO!). Distribution and ecology: Endemic to México, in Hidalgo, Estado de México, Oaxaca, Puebla, and Tlaxcala. Terrestrial, in open vegetation including xerophilous scrub and man-induced grasslands and forest clearings in areas dominated by seasonally dry Pinus and Pinus-Quercus forest, often with species oí Agave, Juniperus, and Opuntia, among the most conspicuous elements, from 1800 to 2800 m elevation. Deiregyne tenorioi is not particularly uncommon and thrives in areas subjected to significant human disturbance. In some grazed areas, plants of this species have been found growing among shrubs of Amelanchier and Ephedra, which apparently lend them some protection from grazing cattle. Plants are found either scattered or forming localized colonies. Etymology: this species is named after Pedro Tenorio Lezama, former botanical collector of the Herbario Nacional de México (MEXU), who gathered specimens of this and many other rare or interesting orchids in the Tehuacán - Cuicatlán Valley and elsewhere in México. The new species is similar to D. eriophora (Fig. 2A), but can be easily distinguished from it by the sparsely and shortly glandular-pubescent rachis and ovaries (vs. lanuginose), the narrow labellum throat with vertical sides, and proportionately longer, narrower labellum and especially the distal labellum lobe. Fresh flowers of D. eriophora are intensely and agreeably fragrant, the wide, rounded throat of the labellum is of an intense golden yellow, and in herbarium specimens the flowers are blackish brown, whereas flowers of D. tenorioi are scentless, the throat is bright green to lemon yellow, and in herbarium specimens they are dull yellow to pale brown. Deiregyne eriophora is the most widespread species of this genus in México and it is also found in Guatemala, dwelling in moist Abies, Pinus, ana Pinus-Quercus forests. Deiregyne tenorioi is also similar to Deiregyne chartacea (Fig. 2B) and it has been confused with this species in literature (Szlachetko et al., 2005, as Oestlundorchis chartacea (L.O. Williams) Szlach.). However, D. tenorioi differs from D. chartacea in its larger flowers (up to about twice as large in linear measurements of the perianth segments), its sepals and petals not tinged with greenish-brown below the middle, the lateral sepals spreading above the middle (vs. strongly recurved), and the proportionately longer labellum with longer and narrower distal lobe. Deiregyne chartacea was previously known only from the western Mexican states of Jalisco and Michoacán, but recently it has also been recorded from the westernmost portion of the Estado de México, where it is sympatric with D. tenorioi (Szeszko, 2011). Deiregyne tenorioi is also distinctive from its congeners in its long, proportionately narrow leaves (Fig. 2I), but this feature is not evident in herbarium specimens because these ordinarily do not include the leaves, which wither and usually disintegrate prior to anthesis. G.A.S. thanks Heike Vibrans and Silvia H. Salas for providing material and information of the new species, the Curators of AMO, ENCB, MEXU, and SERO for courtesies extended during study of the collections in their charge, Rolando Jiménez Machorro for preparing the accompanying line drawing, and two anonymous reviewers for useful suggestions to the manuscript.